A Read-Eval-Print-Loop enables to leverage very rapid application development. This kind of environment is normaly reserved to scripting languages (python, nodejs) and to functional languages (lisp, haskell). Cling realizes the read-eval-print loop (REPL) concept for the C++ language. Thus, you can gain in speed of development while the compiler (clang) still checks your code and guarantees a native speed of execution. See an example of an interactive C++ session here. For a better undertsanding, it is better to clear the outputs below: click on the "Kernel" menu, and select "Restart & Clear Output"
Load, display and manipulate images with opencv. Demonstrates how to load an external library and display advanced items. A Read-Eval-Print-Loop makes functional programing very proficient. This notebook demonstrates it. If you are new to functional programming, it is recommended to view it as a slideshow. The cling and xeus docs are good, but some informations are missing : this notebook adds more details. If you do not want to modify your machine, you can use the docker image provided inside this repo. Refer to the docker instructions. As mentioned before, these demos are available online on mybinder.org. 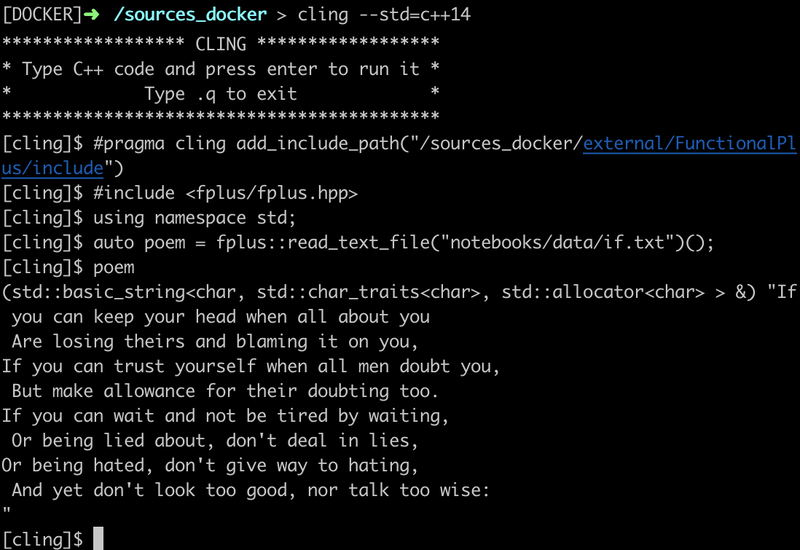 Cling is an interactive C++ interpreter, built on top of Clang and LLVM compiler infrastructure. Cling realizes the read-eval-print loop (REPL) concept, in order to leverage rapid application development. Implemented as a small extension to LLVM and Clang, the interpreter reuses their strengths such as the praised concise and expressive compiler diagnostics. It is based on the Root data analysis framework, and originates from the CERN. Cling is stil under heavy development and might fail (for example a segfault in your program will exit cling REPL). However it is quite useful, and used everyday at the CERN. Xeus cling is a Jupyter kernel for the C++ programming language based on cling.